Officers Group, The Queen's Own Cameron Highlanders. 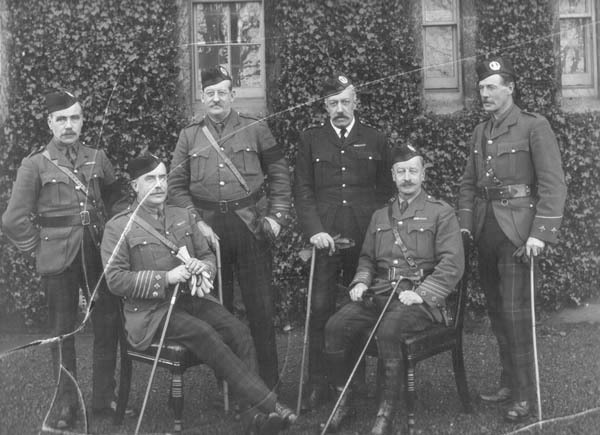 Subject: Officers Group, The Queen's Own Cameron Highlanders. (1) Colonel Malcolm Stewart Riach (1860-? ): Entered army, 1883; Captain, Cameron Highlanders, 1891; Lieutenant-Colonel, 1906; Bt. Colonel and Officer Commanding Regimental Depot during 1st World War. Location: (Possibly) Cameron Highlander's Depot, Inverness. Costume: Service Dress, Officers, The Queen's Own Cameron Highlanders. Biog: The Army List, 1915.